Learning how to clarify butter is easy. Clarified butter keeps longer than regular butter and is wonderful to use when frying hash browns and pancakes because it will not get that burnt black look. Try it with lobster, or in garlic biscuits and shrimp scampi - it is wonderful. If you really want to impress family or friends serving lobster or shrimp, make homemade butter (see link below), and then clarify it. They will think they died and went to heaven. 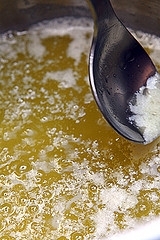 Cut the unsalted butter into chunks and place in a small saucepan on low heat. As the butter melts white foam will float on the top. Just use a spoon and skim this off. What we keep is the clear yellow butter below the foam. Remove from heat and cool slightly. Pour through a fine sieve into a glass jar. The milky residue stays in the bottom of the pan. Do NOT keep this or pour it into your glass jar. You can store the butter in the refrigerator for 14 days or freeze it for 2 months. Two pounds of regular butter = 3 cups of clarified butter. Only use unsalted butter.